He attended Technical College and was apprenticed for two years as an engineer; at the end of his apprenticeship, he applied for admission to the CIM. After two years at the training school, he was accepted into membership. The curriculum at that time included extensive instruction by a former CIM medical missionary in a variety of rudimentary treatments for the most common ailments they would encounter in China, and carried on Hudson Taylor’s practice of giving medical training to new workers. Then came language study for the men’s school in Chinkiang (now Zhenjiang), in Jiangsu. Along with several others from various nations, Bosshardt began the arduous process of learning Mandarin, for which they had been prepared by classes on phonetics while in London. For six hours a day, they had classes alone with the Chinese teacher, who knew no English; group classes; and lessons in grammar from a missionary. After six months, they were all assigned by Hoste to their mission station, which for Bosshardt was Zunyi (now Zunyi), the second largest town in Guizhou. Before the General Director’s visit, he had the memorable experience of joining Hoste for his two hour private prayer time, during which he would pace the room as he prayed for all the missionaries and their children by name. Instead of going immediately to Guizhou, he was sent first to Chongqing for nine more months of language study. About one hundred people, thirty of them believers, attended the church there. Bosshardt and a Chinese evangelist made frequent trips to outlying areas, encouraging Christians, some of whom had lost a great deal from bandits. They sold Christian books in the market, conducted services, and preached to inquirers. Slowly Bosshardt’s facility in Mandarin began to grow towards fluency, and he joined in the circuit evangelism and regular preaching in the chapel at the mission station. Soon, funds for food began to arrive from the CIM and the Peking Relief Fund, They used some of the money to buy coal at a fair price, thus forcing merchants to lower their prices to a reasonable level. Mothers in the refuge used a grindstone to grind the corn and the cereals, making little puddings, which they sold at a nominal price with the porridge they distributed for free. Local Christians did all they could to help. Ugly rumors that the missionaries intended to sell the babies caused some mothers to leave the refuge, but they were replaced with others, many of them bringing disease, which soon spread, leading to many deaths. After a temporary respite after a heavy rain, the famine returned with greater ferocity. Bosshardt virtually adopted a little boy of four and nursed him back to health, showering him with a love that soon transformed the boy into a cheerful lad who constantly sang hymns. As food prices surged again, the magistrate appointed the missionaries as superintendents of government relief funds, which were augmented by more gifts from supporters in the West. Finally, Bosshardt contracted a fever from the people to whom he had ministered. For several days, his life hung on a thread from a severe attack of typhus; in hours of delirium he often sang hymns and prayed. It took more than three months for him to be able to walk normally, and several more months to recover fully. In 1927, he met Rose Piaget, a fellow CIM missionary who was from Switzerland. Rose had departed Europe for China in 1920. After initial language study, she began work in Guiyang, Guizhou, where she continued studying Chinese while serving under senior missionaries. In 1925 she was transferred to Chenyuan, seven day’s walking distance away. Robbers swarmed the area, and danger was everywhere. While Bosshardt was battling typhus, she was caring for forty children orphaned during the famine. When thousands of foreign missionaries were ordered by their consuls to leave China during the Anti-Christian Movement of 1926-27, Rose decided to remain where she was until her furlough, which began in the fall of 1927. Back in China, she was introduced to Bosshardt, and the two formed a strong attraction for each other. With the permission of OMF leaders and their parents, they were engaged to be married, but had to wait until Bosshardt took his assigned furlough in 1930. On the sea journey home, Bosshardt studied French in order to communicate with Rose’s family, whom he liked as soon as he met them. This ability to speak French would later probably save his life. They were married in June, 1931, in a bi-lingual ceremony conducted by both missionary and Chinese church leaders. They settled in Chenyuan, on the border of Hunan, and began their missionary work together. The main problem there was the growing, sale, and use of opium, with the concomitant presence of banditry and violence. Bosshardt himself had already had four encounters with outlaws, and had been captured more than once. They witnessed both the power of opium to enslave and the power of God to set people free through faith in Christ and reliance on the Holy Spirit. During the meeting, both Bosshardt and Rose sensed God speaking to them, promising them grace to sustain them in any circumstances. They would need it. In October, 1934, while traveling to their mission station, the Bosshardts were captured by troops from the Red Army, which was on what came to be called the Long March, taken in flight from Nationalist soldiers. They were later joined by fellow CIM missionaries , Arnolis Hayman and his wife Rhoda, the Haymans’ children, Grace Emblen, and Chinese servants. Accused of being spies for foreign governments and only using their missionary status as a cover, they were also censured for preaching a message that was nothing but “devils’ words.” Their captors forced them to write letters to the CIM headquarters, in which huge ransoms were demanded for each of them. After urgent requests to the commanding general, Rose, Rhoda Hayman, her children, and their coolies were released. Assisted by kind Chinese, some of the Christians, they eventually made it to Hong Kong. That same month, John and Betty Stam, also with the CIM, were captured, falsely accused of spying for foreign governments, and murdered by Communist soldiers. Of his guards and their comrades, Bosshardt wrote, “They were not all cold-blooded, happy executioners, but some were fanatics who would take a man’s life as casually as a chicken’s. Ruthlessly dedicated, with what they saw as honorable design” They carried banners declaring, “Down with landlords!” “The Soviet Government is China’s only hope!” “Religion is the opiate of the people!” Displayed before people in a village, the prisoners heard themselves described as “Big nose, Hook nose – Foreign devil – Deserve-to-die imperialists.” On the other hand, during the long ordeal some of their captors showed kindness, sharing food, warm clothing, and even a horse, and finding medical treatment when possible. All during their captivity together, they received encouragement from the Bible and the copy of Daily Light that Grace Emblen had somehow been able to bring with her. (Daily Light, a compilation of Scriptures on a theme for morning and evening each day, has been used by CIM missionaries and other Christians, including this writer, for more than 150 years.) Later, Bosshardt was given a copy of Mrs. Cowman’s Streams in the Desert, which likewise brought him great comfort. Their concerns were focused more on Grace, who was later allowed to drift away behind the army because she couldn’t keep up with the march, and on their families, whose fate they didn’t know. As long as they accompanied the missionaries, their Chinese servants cared for them faithfully and as much as they were allowed by the guards. For the most part, however, the Bosshardt and Hayman were kept separately from others and under strict guard. Constant negotiations by German missionary Herman Becker, who had previously been friends with Ho Long, one of the Communist leaders, were being conducted through three courageous Chinese Christians (named Chai, Yang, and Ho) who dared to attempt to reach the Communist army holding the captives. The ridiculously high ransom would not be paid, lest all missionaries have a price on their head, but a a realistic amount to cover their living expenses was offered, plus a modest sum of several thousand dollars, all angrily refused by the Red General. Their suffering doubled when they saw prisoners being led away to execution, or heard the terrible cries of others undergoing torture, a common feature of the Long March. The utterly desperate state of inmates in squalid prisons which they sometimes shared broke their hearts also. The trek did not lack opportunities for them to share their faith, however. When, in front of a large crowd gathered to watch a trial of a number of prisoners, the judge asked, “Why did you come to China?” Bosshardt replied, “I came to tell you of the one true God and to call you to repentance.” A Nationalist General Chang had been captured, and Bosshardt had many conversations with him about the faith. At a party held by the Communist leaders, Bosshardt and Hayman were commanded to sing. Since they only knew hymns, they were reluctantly given permission to sing those before the group. On occasion, when they were lodged with other prisoners, they answered questions about their beliefs and the source of their peace of mind. His grandmother had taught Bosshardt how to crochet when he was a boy. After this skill was discovered, he was kept busy with orders to various items of clothing, including little garments for the Communist general’s new baby. After 413 day’s captivity, when had become too ill to continue on the rugged march, Hayman was promised freedom, as was Bosshardt, but on the appointed day only Hayman was allowed to go, to Bosshardt’s great disappointment and disillusionment with the Communists, who had broken their promise. As Hayman left, Bosshardt said, “Pray that I may recklessly preach Christ.” The next several months tested his physical, mental, and spiritual resources to the limit. Sometimes he was so drained by illness or incapacitated by fever or bruised and bleeding feet that he had to be placed on a horse or even carried. Once, he despaired of the ability to continue, and begged his guard to shoot him, but that only made the man more considerate of Bosshardt’s condition, and he later even gave him an expensive orange. When he was finally released after 560 days as a prisoner, the reason given was that he was from Switzerland, which “is not an imperialist country. You have no unequal treaties with China, neither have you any concession” [that is, occupied land in Shanghai or any other Chinese city as a result of the “unequal treaties”]. Since he was unable to walk, he was given a horse to ride into freedom. It was Easter, 1936. At that time, he was ill with pleurisy, bronchitis, beri-beri, and sprue. It took several months for him to be well enough to return to Switzerland with Rose, who had been flown to his side days within his arrival in safe territory. 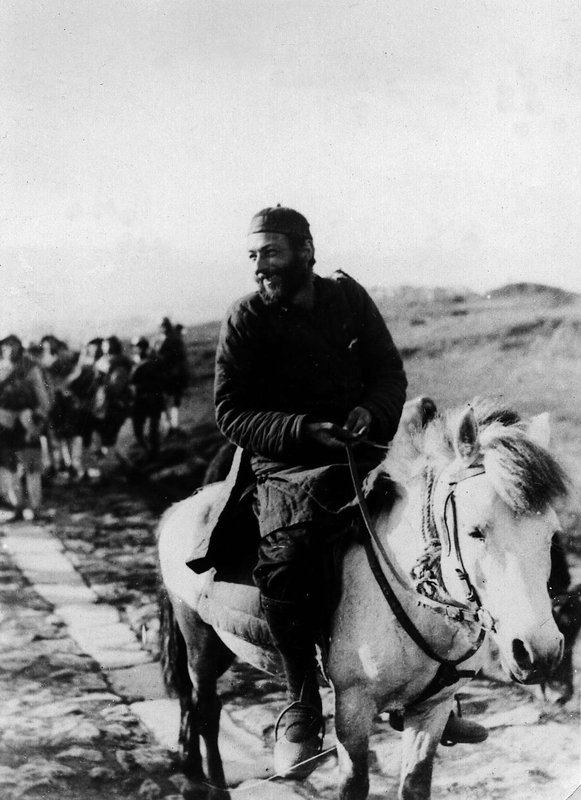 Bosshardt on horse following release in 1936. While in Switzerland with Rose’s family, and then in England, where Bosshardt’s family lived, they had many invitations to speak in churches and other venues about their experiences in China. In 1939, they sailed to America, where again they addressed churches, describing both their missionary labors and the ways that God sustained them during the long captivity. In September, 1940, they sailed from the United States to China, eager to resume work among the people they loved. While in Shanghai, Bosshardt visited prisons to comfort inmates with the gospel. Because of the Japanese invasion, they had to travel back into inland China by way of the Burma Road. Arriving in Panxian (Panhsien), Guizhou, they plunged immediately into the task of building an indigenous church from a base of only four members. In addition to preaching and teaching, they sold Bibles and Christian literature, held family prayers in their home, and engaged in personal witness. Soon, the meeting hall was overflowing, so the believers prayed for resources to rent a larger space. A businessman offered them the use of the second story over his medicine shop, which was dedicated as a chapel. In 1943, Rose and Aflred gained permission to visit the women’s and men’s prisons, where the conditions were awful. Seeing the emaciated faces of the prisoners, Bosshardt asked to be given rice water that was normally thrown away, and took that to the inmates. They later also distributed glutinous rice that American soldiers were going to discard because they didn’t know how to cook it. As the years passed, their team grew, so they were able to travel to neighboring villages and towns to evangelize the inhabitants. Bosshardt served for a while as chaplain to the American soldiers camped nearby. Rose continued to help women in childbirth. After a short furlough in 1947, they returned to Panxian in 1948. Soon, the Communists army’s advance neared their area, and the CIM told its workers that any who wanted to leave China could do so. Despite their earlier ordeal, the Bosshardts chose to remain with their Chinese friends. At first, the Communists allowed the missionaries and Chinese Christians to continue all their usual activities, even while landlords were being first impoverished and then executed. Then they were told that they were not to preach the gospel outside the chapel, thus ending outside meetings and home visitation. Next, the school was closed. The Communists rounded up beggars, gave them food and new clothes, and set them to spying on residents, including Christians. Terror swept the city as false accusations of all sorts brought innocent folk before harsh tribunals. “Executions became commonplace.” Christians were told to recant, but only one out of seventy members of their church gave in. A full registration of all believers in the town showed that two hundred had declared themselves Christians. They conducted two baptismal services without hindrance, but Bosshardt and co-worker were arrested after a third service. From then on, the Communists’ previous courtesy changed to hostility, accusations, and threats. Finally, in January, 1951, CIM headquarters told them to apply for permission to leave China as soon as possible. Their safety could not be guaranteed, and even the local Christians agreed that the foreigners had become a liability to them. After a brief stay in Hong Kong, where they sought guidance for future ministry, they sailed for Laos, settling in Pakse, a town with many Mandarin-speaking Chinese. For fifteen happy years they worked there, teaching French and English, gaining subscribers for Tengta (Lighthouse, the Chinese-language magazine published by the CIM, which had been renamed Overseas Missionary Fellowship), visiting in homes, and preaching and teaching in the chapel. Fifty children attended daily meetings, thirty adults came to Sunday worship, and about a dozen showed up for Bible study on Wednesday night. They went on their last furlough in 1963. Though they had reached retirement age, they requested, and received, permission to return to their ministry in Pakse. Rose became critically ill and passed away two years later, the day before they were to leave for home, doctors having decided that they were now too old for continued life in tropical conditions. Bosshardt was surprised to find that many Chinese had moved to Manchester, England, since his last visit. Though limited in strength because of liver illness, he entered into ministry among them, saying, “They are my people.” He worked with the Chinese church until 1990, when paralysis caused him to rest completely. He died in 1993, at the age of 94. “Bosshardt’s book describing his captivity, The Restraining Hand (the title indicating the divine restraint on his captors), was reprinted several times. Three decades later with the help of ghost writers, he retold the story as The Guiding Hand, in the wider context of his life. A Chinese version bears a commendatory foreword by the Communist commander, Xiao Ke, the last surviving leader of the Long March, whom Bosshardt met again, in friendship, in the 1980s.” (Walls, Biographical Dictionary of Christian Missions). “Devoid of rancour, The Restraining Hand is a timeless classic of missionary literature to be read and re-read” (Broomhall, 554). Alfred Bosshardt, with Gwen and Edward England, The Guiding Hand: A Story of Miracles & Answers to Prayer in China. Wheaton, Illinois: Harold Shaw Publishers, 1973. Andrew Walls, “Rudolf Alfred Bosshardt,” in Gerald H. Anderson, ed. Biographical Dictionary of Christian Missions, Macmillan Reference. Grand Rapids, Michigan :Wm. B. Eerdmans Publishing Co.,1998. Broomhall, A.J., Hudson Taylor & China’s Open Century. Book Seven. It is Not Death to Die! London: Hodder and Stoughton, 1989.